While all eyes are on PlayerUnknown and his Battlegrounds, his is not the only Battle Royale game available. 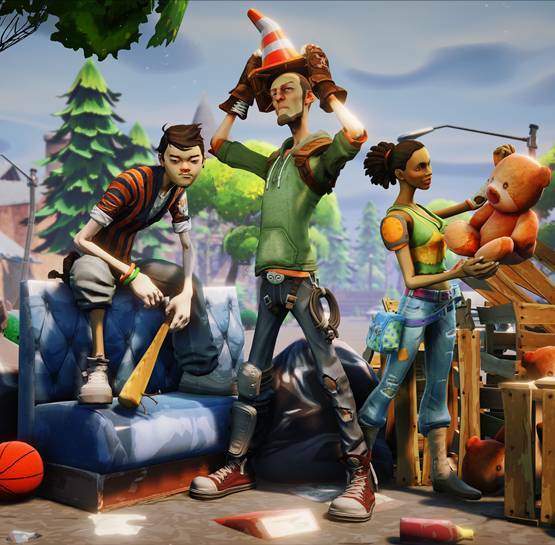 Epic Games continues to polish their cartoony take on the genre with the new Patch 1.10 now released for Fortnite, which among other improvements introduces some UI changes and bug fixes, as well as net code improvements. Players will find a new inventory system when they next launch the game, as well as generally improved PhysX and game performance, including graphical improvements like detailed shadows. Controller players can also expect some QoL updates to help them be more successful with their chosen input, such as reduced aim assist and sensitivity slider options. 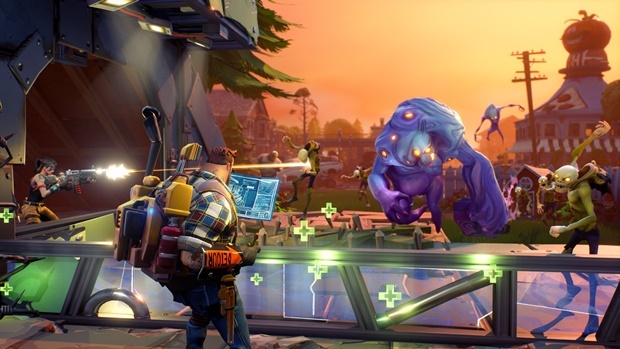 As many as 10 million players have been enjoying Fortnite: Battle Royale since launch. You can see the full patch notes just below. Decreased chance of getting Bandages from Treasure Chests and Supply Drops by 35%. Reduced aim assist on controllers. This should make it easier to lead targets with Sniper Rifles. The updated aim assist system allows us to iterate easily. Let us know how you think we can improve aim assist. Improved network priority for doors, which reduces the likelihood of seeing players run through a closed door. Improved network priority for chests, which reduces the likelihood of them appearing to remain closed for a short time after opening them. Players will no longer fall through the world if they are eliminated while jumping. Gliders will no longer deploy if a player uses a Launch Pad in the DBNO state. Player will no longer jitter while falling and skydiving. Dancing no longer goes on cooldown if it fails to play. Chests in attics no will longer spawn loot on roofs or outside walls. Fixed an issue which caused players to sometimes survive fatal fall damage with 1 HP. Fixed an issue causing teammates names to jitter. Fixed an error message that players would sometimes receive when being invited to a BR match when they hadn’t completed the Save the World tutorial mission yet. Removed tracers from the silenced SMG. Sniper Rifles no longer reload while in scoped view. Fixed an issue which prevented grenades from exploding. Fixed an issue which caused crosshairs to disappear if a Sniper Rifle was fired right before the Battle Bus took off. Smoke effects now appear the same in and out of the Storm. Players can no longer see through smoke effects when using a scope from within the smoke. Players will no longer experience a “flash” effect when multiple smoke grenades go off at once. Reduced volume for ambient trap sounds, and made them less frequent. Added a new warning sound that activates when a player approaches a ceiling or wall trap. Teammate footsteps now sound quieter than enemies. If you are spectating a player, their footsteps are quieter. Added different footstep sounds for wood, stone, metal, and dirt/grass surfaces. It’s now easier to hear footsteps through walls. Added “terminal velocity” wind sound when falling from large heights, and impact/pain sounds for when taking damage from falling. Increased the audio range for the sniper gunshot from 180m to 250m. Reduced volume of revolver equip/reload/fire sounds. New sounds for Medkit, Shield Potion, and Slurp Juice consumables. It is now easier to hear the sound of an another player gliding towards you after using a Launch Pad. All audio for the dance emote is now adjusted with the SFX slider instead of Music. Wind volume reacts more dynamically while skydiving or using a glider/umbrella. Removed low-frequency content in the “ticking clock” sound that plays prior to the storm eye shrinking. These frequencies could have previously been mistaken for footsteps while running. Improved general framerate when multiple characters are nearby. Improved server performance by reducing the number of redundant movement events sent from clients. Improved Xbox One rendering by reducing CPU stalls. Improved performance when rendering lighting and shadows. Improved performance when rendering bushes and other clutter objects. Improved game thread performance by converting more game logic BPs to C++. Improved CPU performance on Xbox One and Windows by tweaking thread priorities. Improved performance of particle systems by adding batching. Improved performance of animation trail effects and particles. Improved performance when using the glider. Optimized particles associated with players/weapons. Optimized audio for the safe zone indicator. Tweaked how often animations update and optimized many other animation systems. Reduced general hitching by optimizing garbage collection of objects loaded within memory. Reduced network bandwidth used when spawning players in a squad match. Fixed a server performance issue caused by building actors that moved every frame. Fixed a server performance issue where rubber banding could be caused when jumping out of the Battle Bus. Fixed various hitches that could occur during gameplay. You can now view your personal stats and XP gained at the end of a match or when spectating. You can now choose to abandon one of your Daily Challenges each day. Added “Net Debug Stats” panel to the Battle Royale UI. This setting displays ping, bandwidth, packets per second, and packet loss for both uploading and downloading. If you haven’t received a packet from the server in more than 1 second, the UI will also display a “Connection Lost” warning. Currently this is only available on Windows and Mac platforms, but we hope to enable it on consoles in a future update! Added some look-and-feel polish to the matchmaking buttons. Added a warning message that activates when players attempt to disguise themselves as a bush while already disguised. Increased the size of the large map so it takes up more screen space when open. Sensitivity sliders for the mouse and gamepad will now stop at 0.1 instead of 0.0. Character models inspected in Save the World will no longer be displayed in the Locker tab. The Up button on the D-Pad no longer closes the inventory tab while using the Pro Controller layout. Settings will now properly save when players apply them and back out of the settings menu quickly. Added descriptions to equipped items in the Locker tab. Storm zone graphics will no longer flicker when the storm begins to close in. You can now report players that have unicode and Chinese characters in their names. Fixed the timers on the Global Wins leaderboard. [PLAYER] was knocked down by the storm. Smoke grenade effects are now visible to spectators when watching a player within the smoke. Fixed bug where teammates could be invisible while spectating them. Scope visuals will no longer be stuck on screen while switching between players in spectate mode. Fixed a rare crash that could occur when backing out to the Main Menu.